Summer is here – and if you’ve taken on the role of holiday host, your family and friends will soon be arriving! Whether you celebrate Christmas, Hanukkah, Kwanzaa or something entirely special to you, the Aston Homes team have put together a handy guide to ensure every event you host this festive season is a success. If there’s one thing the Aston Homes team know is that preparation is key! If you’re planning a festive feast to celebrate the year’s end or simply could not function if you ran out of coffee beans, it would pay to get your supplies early before the last minute panic sets in. Also, keep in mind that many stores will close their doors over the upcoming public holidays. While it’s wonderful that our hardworking retail employees will enjoy a restful break, you’ll need to ensure you’re well stocked up. We suggest heading online to check the opening hours of your go-to grocery stores, or even putting in an online order while you’re there. Traditionally, all Coles Express supermarkets are open from 7am on Christmas Day for emergency purchases, but traditional Coles stores are closed. All Woolworthsstores are also traditionally closed on December 25th. 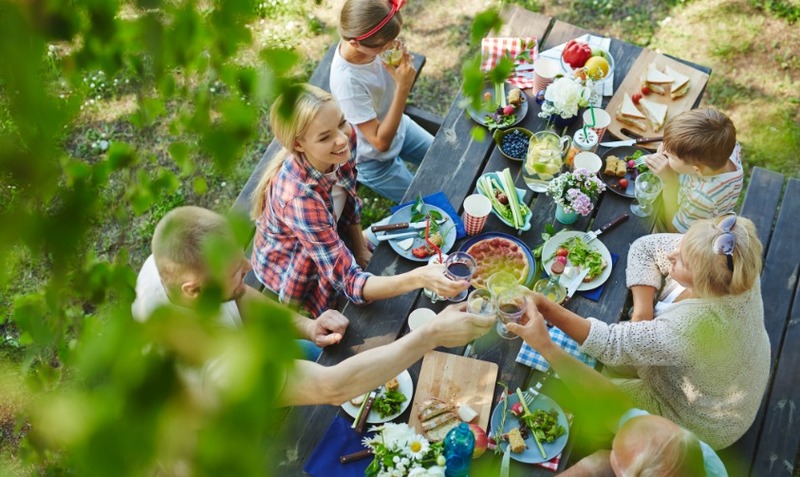 Not only are the summer holidays a popular time for the kids to host sleepovers and slumber parties, it’s also common for visiting family and friends to enjoy an extended stay. For these overnight visits, it’s helpful to have a guest bedroom prepared. To begin, we recommend that you imagine that you’re coming to stay in your own home. While it may sound silly, this will help you to create a comfortable space for your guests. Is there a place convenient for storing a suitcase? Are there hangers in the closet? Are there fresh sheets and fluffy towels at the ready? Perhaps even a lamp for late night reading? If you’ve ticked all these boxes, you’ve got yourself a perfect holiday guest suite! Family get-togethers, picnics and trips to the local pool or beach are just a few of the things that we love about this time of year! To entertain the little ones these holidays, we recommend visiting some local parklands. Aurora Estate’s Adventure Park, Craigieburn’s Golden Sun Moth Park or Williams Landing’s Ashcroft Park are some of our favourites for a picnic and play! For the older family members, perhaps you’d like to plan a fancy dinner out. There are also plenty of fun and festive activities scheduled in the communities in which Aston Homes build. From Hume City Council’s Christmas in the Plaza to shopping for local treats at Tarneit Night Market and enjoying family films at the Moonlight Cinema in Point Cook – the summer holidays are the perfect backdrop for memory making! The Aston Homes team would like to wish all our clients, friends and family a very happy holidays and safe start to the New Year. We do hope to see you out and about in Melbourne’s north and west this festive season. Take care!